This is so frustrating. 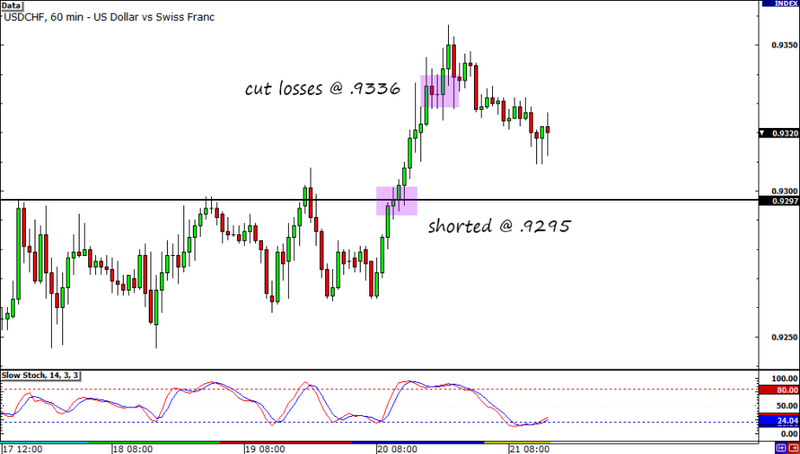 As you all probably know by now, my USD/CHF trade didn’t work out very well. After my limit sell got triggered, market sentiment took a turn for the worse which resulted in wide-spread risk version. Worse-than-expected manufacturing data from China as well as Europe sparked risk aversion and fueled the dollar’s rally. As soon as I realized this, I felt that my stop loss would probably get triggered if I kept my trade open. Like the good girl that I am, I decided to just close my trade early and cut losses. To be honest, I’m very frustrated with my trade as it didn’t even go my way once. I should’ve realized that the pair was severely oversold and it was ripe for a pullback. Forex trading can be so psychologically and emotionally draining sometimes, ugh! But it’s okay. There’s always another day to rack ’em pips! I hope y’all had a good week. Enjoy your weekends! Last week, I pointed out that I had a short bias on USD/CHF because it had broken through the 100-SMA on the daily chart. I also said that I was going to look for a short entry on the lower timeframes. Well, it looks like the time has come to jump in! 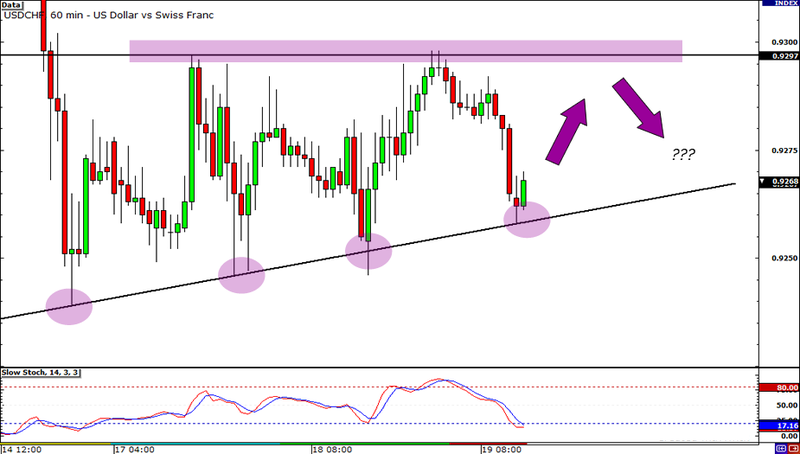 As you can see, USD/CHF is forming a narrowing range on the 1-hour chart. With Stochastic showing oversold conditions, it seems that the pair could bounce soon and retest the most recent swing high at .9297. If price does get up there, I’m going in short to ride the long-term downtrend. On the fundamental side of things, I still think that the Fed’s open-ended QE program would continue to weigh on the dollar. Fed President Ben Bernanke was extremely dovish in the bank’s latest statement and I don’t think investors would easily forget his remarks. Aside from the sweet setup, the SNB’s decision to keep the peg on EUR/CHF steady at 1.2000 also convinced be to go long on the Swiss franc. I know from Forex Gump that the SNB isn’t exactly optimistic in its outlook for the Swiss economy. However, I think that some investors are just relieved that the bank didn’t raise the floor to 1.2200 and so, we could see the franc extend its rally. There ya go! That’s my two cents. What do you guys think? Hit me up!